Raja Ampat is home to the world’s most diverse marine ecosystem. It contains 80% of the world’s coral species and more than 1400 species of fish. Micro and macro plastic threatens the delicate ecology of Raja Ampat’s marine environment. 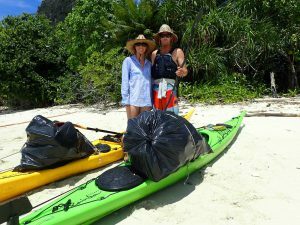 Expedition Engineering engages in beach clean ups in the areas we paddle. While on trip we collect garbage from as many of the beaches as possible and transport it to a recycling plant in Sorong. Our efforts are focused on cleaning up plastics in order to keep Raja Ampat’s beaches pristine and to prevent that plastic from returning to the ocean. The amount of plastic we collect is small (about 500kg per trip) however the educational benefits to the locals is huge. Culturally it has always been acceptable to discard of waste in the ocean. Our recycling program is teaching the locals the importance of keeping the oceans free of plastic and the need to adopt a suitable waste management practice. We are now seeing locals actively collecting plastic and giving that plastic to us to transport back to Sorong. The recycling plant in Sorong has been set up by the Misool Foundation, Money made through our beach clean up, that gets recycled, is donated back into the organization to help with education and setting up new recycling facilities across Raja Ampat. Guests can donate 5% of their trip costs to the Misool Foundation in order to advance the recycling and garbage program in Raja Ampat. Our (The Misool Foundation) joint mission is to safeguard the most biodiverse reefs on Earth through the empowerment of local communities, providing a structure by which they are able to reclaim their traditional tenureship of reefs. The Foundation maintains a broad approach to conservation, combining environmental, social, and educational elements. Their recycling program is the focus of our partnership with the Misool Foundation. The Misool Community Recycling Project incentivizes small communities to properly dispose of waste. Misool Foundation purchases 36 types of rubbish directly from underserved coastal communities. The waste materials are collected and then shipped back to mainland, where the goods are sorted, cleaned, chipped, and packed for recycling. Members can choose to be either paid directly for their waste, or to leave the funds in the ‘bank’ and collect interest at a later date.